Powe steering was consider an option. many of the early '83-'84 T4wd did not have PS, they are lighter and do not have the drag of the pump on the under-powered engine. If the steering system is in good shape you can get along without it, I have owned both and hardly notice...except when trying to parallel park (it takes muscle to turn the steering wheel when not moving). Most all of the '85 and newer came to the dealers factory equipped with PS, not sure if that was coincidence, or if they just discontinued the manual steering rack altogether, there were other changes to the steering system that year as well. Well the DLX definitely doesn't have power steering...but my new (to me) SR5 does!! The yard owner couldn't get me out the door for $700...had to pay tax but he let me pull the blower motor and some other odds and ends off the parts car there. I hope I don't find any more cheap Tercels for sale any time soon cause I'll likely have to buy them. lol. Nice Score! I have never seen a tercel with that front end in person lol. Yea, I thought it looked different too but I can't find any info. Was that grill just on the 86s? In North America, that grill and composite headlights (with the different side marker lights) only came on the '87 model year, and the '88 model year that was discontinued half way through the year (it is assumed they were just using up parts to make the '88 model since the the other Tercels has already been redesigned as a transvers engine install, and alas, the T4wd run came to an end). So that front end clip is rare indeed. if you dont rescue the car from the wrecking yard, best to pull all of the front end parts (grill, marker lights, headlights and mounts) just to save them for these forum members that will need those parts sooner or later. Thanks for the info. I double checked the door plate and it says Dec 1986...so basically an 87? The yard car is an 83 so the front lights are way different. I've already grabbed a lot from it...taillights, grill, lots of trim pieces, mud flaps, dome lights, mirrors, marker lights, lenses, double din cubby, sr5 moulding and badges, grill, vents. There's a decent cargo cover but I didn't take it cause my Terc is a Dane mobile. I'm actually leaving the passenger seat out so he can ride next to me. Which is why I really need to get the passenger window working! I'd grab the cargo cover! There is a ready market for it here, regardless of the shipping cost! Ditto with the "undertray/'skidplate' between the front bumper and X-member - those two are in the "unobtainium" category! I'd be interested in the cover for the middle brake light - tan/brown preferred, but Hey! I can always paint it! I'll grab the cover next time I go then...maybe tomorrow. It's blue carpet with one small wear/hole spot but the fiberboard looks pretty decent. Is there a price point at which I shouldn't grab it? I'm guessing they'll say 20 bucks. If the skidplate is there it's probably messed up as they take all the wheels off the cars and set them on the ground. I'll have a peek next time. Luckily my 83 has the skidplate...haven't even checked my 86 yet but if it's not there, I'll swap it over. There is no 3rd brake light on the parts car...I need a black one myself. Speaking of unobtanium...how impossible is it to find a decent drivers seat and passenger door panel in the black tweed sr5 pattern? On another note...I spent about 2 hours vacuuming out the 86 yesterday and it looks great in there now...so good, in fact, that I went to the fabric store today, snagged some black vinyl and sewed up some new shift boots. They could be better but I'm happy with them for a first go. I know there's a pattern on here somewhere but I don't have a printer so I just cut them apart and traced them. Don't mind the filthy blanket...my pup drools a lot. Just realized "I'd grab the cargo cover," meant I should grab it...not that you want it. Lol. Hey, your resolution of the boots looks pretty good! It was "fun" matching the parts, right? As far as a blue cargo cover goes - its "base" can serve as a pattern for a tan (or other color) replacement rug color, or possibly could even be dyed to which ever color one needs - but I think as the base for a rug overlay. While I have an OE cover for my '86 Goldie (modded from an '84), I still have, in "reserve," a lightweight outdoor/indoor of an appropriate tan color when/IF I get around to replacing all of the carpets. Thanks for the link. Yea, it was pretty hard to trace the old boots accurately cause they were so deteriorated. I got a half yard of vinyl though so when I can get your pattern printed I'll have another go. Good thoughts on the cargo cover...I'll snag it today. Has anyone on here replaced their headrest/seat foam? Mine is crumbling. The 86 is cleaning up so nice I'm thinking of doing a full resto on it, making it my commuter, and keeping the 83 as the Dane mobile (I was contemplating selling it). I'm so appreciative to have found this site and all of the great info, resources, writeups, and encouragement from you all. Happy New Year everyone!! Thanks for sharing your progress! I made some boots for my gearsticks out of an old wetsuit that seemed to work quite well! Please show more photos. 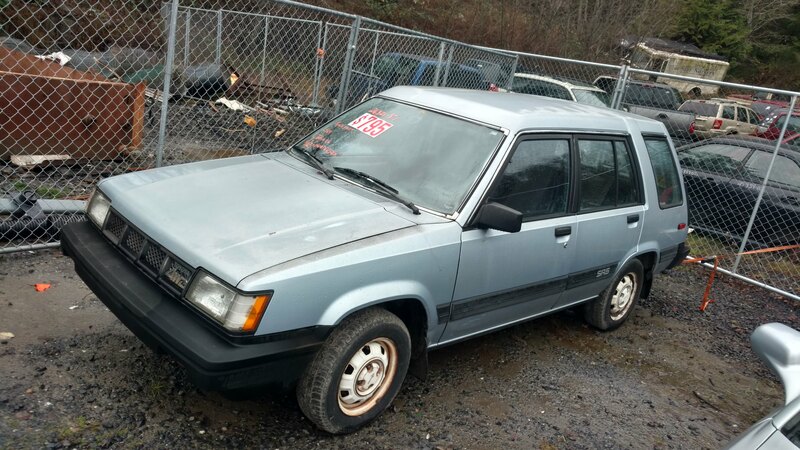 great that you were able to save a Tercel from the wreckers! 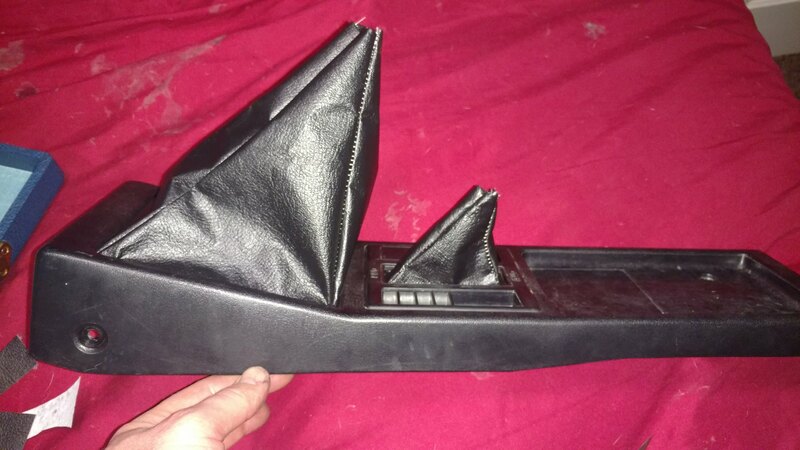 I may have a headrest for your 86 in the appropriate fabric, if you're interested. Definitely interested! Do you happen to have a front passenger door panel? Nope, sorry. I was able to snag a pretty nice passenger's side seat that I cannibalized to replace my worn out drivers seat, hence the spare head rest.